ATTENTION: The DjVuReader program is outdated and inadequate. It is strongly recommended NOT to use it. On this page you can see an archive copy (slightly corrected) of a dead project "OpenDjVu". The project is no longer supported by its author, and the author does not respond to e-mails. 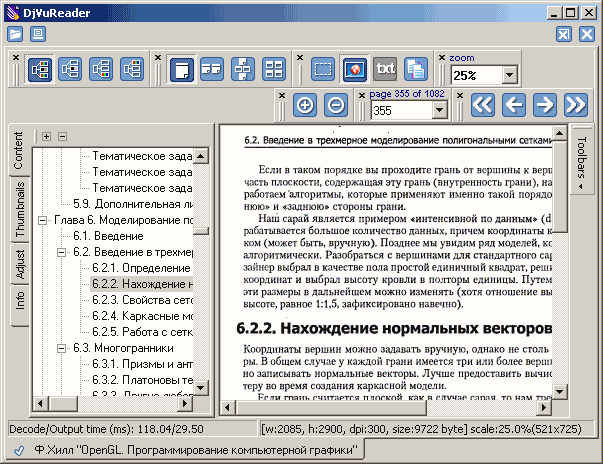 DjVuReader is intended for viewing djvu files in Windows95/98/XP. [!] by numerous user requests I started the code refactoring - to open the sourcecodes. [+] saving of size and window place. [+] saving of content panel width. [*] floating panels for toolbar. [+] added option "Show page numbers in content". [+] added option "Draw border around page". [-] didn't have switching to page in content that was defined by line. The program DjVuStudio is intended for editing the DjVu files. It will mainly represent a front-end for the utilities from the DjVuLibre package. I lay out a project file for cjb2 from the DjVuLibre project - so that you can compile it yourself in VC7. The utility is compiled with the tiff support, so to compile it you must download a library from http://libtiff.org. (Windows Binaries: http://gnuwin32.sourceforge.net/packages/tiff.htm). A corrected version djvused8.exe (download [252 kb]). Now everything which has the code >127 в ascii is output "as is" - but not in octal numbers. The package contains the corrected version, so if you downloaded the package earlier than 11 July 2004 - you can take only djvused8. P.S. : Some testing is required. If you find some bugs - e-mail me. The tree-content which DjVuReader program can insert into DjVu-files has its own special format - unlike the standart DjVu-bookmarks that can be seen in numerous DjVu-viewers - browser DjVu-plugin, WinDjView, Fancy DjVu Viewer, Java DjVu. That's why you can not see the DjVuReader's tree-content in any of these viewers - but only in DjVuReader itself. The strings obey the C++ language rules e.g. \n - newline \" - quotes etc. The content: the inserted sections are separated with a blank space. At the moment the TOC is loaded with TreeView->LoadFromStream(...). I am considering to switch it to XML. The pages in TOC are bound to the indices. If no idices are available or the number is less the the number of the pages - they are padded with a number sequence from 1 to PageCount. If the index is not found - nothing happens. All this will be in the documentation in more detail. There is one more example of the tree-content code. A book in Russian with the content and the index M.Fauler "UML.The bases"
Send all remarks, questions and bugs to e-mail: opendjvu@mail.ru and opendjvu@nm.ru. Copyright (c) Dmitriy Gar'kaev aka Dickobraz, 2004.